Recently there has been some very strange sighting in a nice little town called Hull In England. Over the past couple of months there have been several sightings of a half human, half dog like creature roaming wildly in the woods near the city of Hull. Eye witnesses have told the authorities that they saw a very disturbing creature running on all 4 legs and at times it was only running on 2 legs and they also stated that it must have been at least 8 feet tall. A woman who claimed to have seen this mysterious beast told the Express Newspaper: “It stood upright one moment then it was down on all fours running like a dog. I was terrified as I watched it vault 30 feet over a wall. Now in total there have been 7 people swearing that they saw this monster and the residents are pretty scared and they have been trying to capture it. But as of yet this creature still remains a mystery making everybody wonder what it could possible be. Now no one was hurt or attacked but I just came across this story as I was making this video so I wanted to let you guys know about it as I find it very interesting. 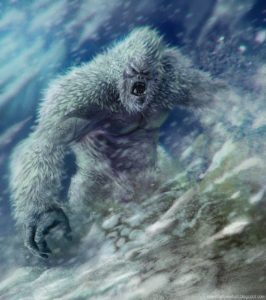 In Nepal and the surrounding regions there are 2 type of Yetis. One is a huge being very similar to a Bigfoot and the other one is only about 5 feet tall and very similar to the Russian Alma. Now many believe that this shorter Bigfoot is actually a Neanderthal. One of the most famous of these encounters happened in 1974 by a 14 year old girl who was attending to her yaks when something came charging down the mountain, grabbed this girl then pushed her into a stream. Now this young lady was terrified beyond belief but thankfully she was OK and she sat there terrified watching this creature just devour her livestock. And this young women said that this monsters was dark brown, very hairy, had a wrinkly face, long nails and it walked on both its hind legs and all fours making it sound kind of like a werewolf. And she also said that it was only about 5 feet tall but what it lacked in size it made up for in strength as it was able to twist the necks and kill these yaks like nothing. Now this girl just sat there traumatized and couple of hours later her family found her in tears. And when the police showed up they found some very strange bite marks on the yaks and they also discovered some very odd footprints in the snow and over the years there have been a lot more sightings of this creature. Another very terrifying encounter comes from Texas when a rancher gave his son a rifle and told him to go into the woods to shoot a deer. And when the boy didn’t return the rancher formed a search party and they set out to go find him. As the rancher and the search party made their way through the forest the rancher heard a noise in the distance. And the rancher tore through the trees hoping that his son was making this noise. But then he saw a gigantic werewolf like monster and this monster was eating his son. Now the rancher was horrified and quickly shot at the beast but he missed and this monster ran back into the woods. And sadly the rancher was too late as his son was dead. Now know one else saw this creature but they heard the shot and they saw the boy’s body just ripped to shreds. And after this encounter the rancher locked himself up in his cabin and starved himself to death. In 1892 a young man was bathing in a lake when something with very powerful jaws and very sharp teeth locked onto his legs and tried to pull him under water. And the young man was screaming for help and thankfully two of his friends were close by and they ran to his aid and were able to pull him onto the beach. But this creature wouldn’t let go of their friend as it was still hanging onto his legs. And the 2 friends were now able to see in disbelief what this thing was. They said that it had the body of an alligator, the head an eyes of a snake, a very long scaly tail and also bat like wings. Now they were terrified but instead of running away the tried to kill it with knives, rocks, sticks just basically whatever they could get their hands on. And they said that this creature was UN killable and it would not let go of their friend. So they built a fire and dragged this monster over it but that only made things worse as now this creature was eating him. Then it flapped its wings and flew away with this young man still in its mouth and he was never seen again. Now a couple of days later a local newspaper caught wind of this out of this world story and they published an article about this missing boy and the monster that ate him. Making people wonder if these 2 young men were just making up stories trying to cover up what really happened. But people also wondered that if foul play was involved or something else happened to their friend why the heck would they make up a story like that. On August 4th 1957 in Suffolk England there was a very, very bad storm and the citizens ran to Saint Mary’s church for shelter and to pray. And while they were preying a very mysterious and very evil looking dog somehow broke into the church and started killing people by way of ripping out their throats. Some of the eye witness even said that they saw this dog use its paws to strangle people. Now the people were screaming there heads off and they ran away as fast as they could and once this dog was no longer in site they came back to the church and found 3 people dead. But the night was still young and a couple of hours later this dog broke into another church and killed more people. And when the storm was gone this mysterious dog seemed to just disappear. 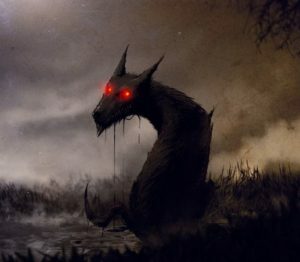 Now the people called this creature a hell hound and they also believed that this creature possessed supernatural powers and if you visit this church you can still see to this very day where the hell hound burnt the church door. Now throughout the world there are many people who swear that they have come face to face with a hell hound and only through the grace of god were they lucky enough to escape with their lives. Now this next encounter is pretty famous and I believed I may have covered it before but since it one of the most famous monster attacks in recent history I will cover it again for those that have not heard about it. On January 16th 2004 police started receiving very odd calls about a mysterious flying creature that was scaring people to death. So a police officer decided to go check it out and while he was driving down the street he saw something jump down from a tree. So the officer flicked on his high beams to get a better look and he saw a women in a black cape and a pointy hat. Now this women had solid black eyes and was somehow able to float above ground. Then she flew towards the car landing on the hood and she just stared right at the officer with her soul less eyes. Now the officer was just terrified and he called in for backup and put the car in reverse and just floored it. But the women managed to hold on to the car then she started pounding on the window trying to break through the glass. Then the officer hit a wall and blacked out. Now the next thing this police officer remembered was waking up in an ambulance shaking, he was still in a total shock and he told everybody what happened. And he was tested for drugs and alcohol and the results came back negative. Now his fellow police officers had no doubt that something terrifying must have happened to their friend but what it was they can not say. But after this event thousands of people came forward and said that they too had seen this women, making this one of the most famous, and interesting monster attacks of all time. « Did Eskimos Come Face To Face With Giants? PJ, great video, really enjoyed it! I sometimes wonder if our world is actually a lot like the tv show “Supernatural”. I wonder if there’s real life “Winchester” brothers out there trying to keep us safe. Hopefully it hasn’t been a real life “Frankenstein” who has created the monsters! !